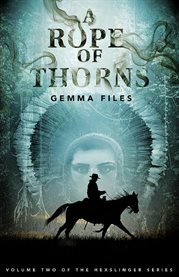 The item A rope of thorns, Gemma Files, (electronic resource) represents a specific, individual, material embodiment of a distinct intellectual or artistic creation found in Austin Public Library. New Mexico, 1867. Hexslinger 'Reverend' Asher Rook has founded 'Hex City' and as a consort to resurrected Mayan goddess, Ixchel, he has even sacrificed in her name and torn a crack in the world, remaking everything around him.